The fresh new design of the iSpring Learn admin panel changes the way you interact with the learning system. It makes your workflow smoother than ever before. We’ve put a lot of hard work into this project, weighed all the pros and cons, looked at the most frequent user scenarios and optimized them with an enhanced appearance. The new admin portal conforms with the user portal which was updated 6 months ago. This design evokes familiar iPad applications, and it’s good for both computers and touchscreen devices. Let’s do a quick review of each item. Every time you login to your account, you will be greeted with the most frequently used features in the Getting Started popup window. Here you can quickly upload content, add users, and customize your account. If you don’t like popup windows, you can turn it off. The main menu is on the left, and the Dashboard item is opened by default. It gives you important and relevant information on managing your learning portal, user activity, content updates, and more. Each section of the new dashboard has been given an updated look and feel, with immediate access to management and reporting functions. The Content section offers enhanced content management settings and an improved table grid that shows public permissions settings, which is important when you’re sharing content with a wide audience. Just click an item to edit its settings. Here, you can give it a title and description. Upload your own course image by clicking on its picture (Requirements: 298 x 182 px; PNG, JPG). Open the Settings tab to toggle completion certificates and notifications. iSpring-made course completion settings can also be adjusted here (passing score, number of slides required to view, etc.). Go to the Availability tab to get a direct link to the content item, and enable e-commerce and viewing restrictions in one place. The other tabs have been updated with the new design as well. You can view and manage all the comments related to the course from the Discussions tab. This section shows the familiar order of report types in iSpring Learn with minimal visual changes. The convenient procedure of generating reports remains intact, so you are free to go and get a report as you always have. All settings related to user management have been moved to the People section. Here you can edit existing users, add new users, and export your user list to .csv, .xml, or .pdf format. You can manage Groups and Organizations and customize User Profile Fields in the same place. Just select the corresponding tab. On the User Profile Fields tab, you can simply drag and drop items to change their order. To add a new item, select Click here to add a new field. To edit or delete, click on the pen or trash icon respectively. These operations are now very fast and intuitive because they don’t require page reloading after every minor change. Click the Save button after you’re done adding or editing items. Any other changes will be saved automatically. The Settings section lets you control your account information and branding, and gives you access to extra features for managing your account. For example, you can change your account URL name, set your domain alias, enable the self-registration feature to ease the process of registering new users, and much more. 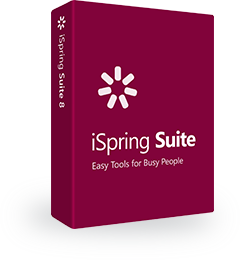 Not only the look of iSpring Learn has been redesigned, but also some highly-requested features were implemented. It’s so natural now to go to the People tab and change any user’s email. Before this update, each email was a unique identifier and, once created, couldn’t be changed. Note: You can’t change multiple emails and import them as a CSV file (People > Users > Add New User > Import from file). In the CSV file, each email is a unique ID, and system can’t guess which user emails were changed. Use the web interface to do that. Now the system can detect the payment date and time and give access to the course for a certain period of time (e.g., 5 days after purchase). After this time, access to this course will be restricted. Go to the Content on the left menu. Select the item you want to sell (rent) for a specific period of time and click on it. Check Enable e-Commerce and set the desired price (e.g. 49.00 USD). Note: Currency can be changed (Settings > More > E-Commerce > Currency). See below for more details. Scroll down to where it says Viewing Restrictions and click the Specify display time checkbox. Enter the number of days you want this content to be active after purchase. Click Save in the upper right corner. Otherwise, the settings will not be applied. Select the specific Currency from the dropdown list, e.g. Euro (EUR). Also, you can change the Payment Method to either PayPal or Authorize.net. Very soon, we are going to introduce a revolutionary new Learning Path feature, which will help you create compound courses with specific completion paths. Last year we updated our user portal to conform to modern design principles. Now it’s the admin portal’s turn to look awesome! Both teaching and learning are extremely pleasant in the new updated LMS. Thanks for reading this article. We hope you enjoy working with your new admin panel! Have any questions? Feel free to share in the comments below.